These flat iron baluster shoes are required to hide the reveal that is left where the 1/2" square iron balusters are installed into a level surface at the bottom of the baluster. While these straight iron baluster shoes are a must-have at the bottom, they are not necessarily required at the top, because the top of most iron balusters is round, but most of our customers choose to use the shoes at the top, to keep things consistent and uniform throughout the staircase. 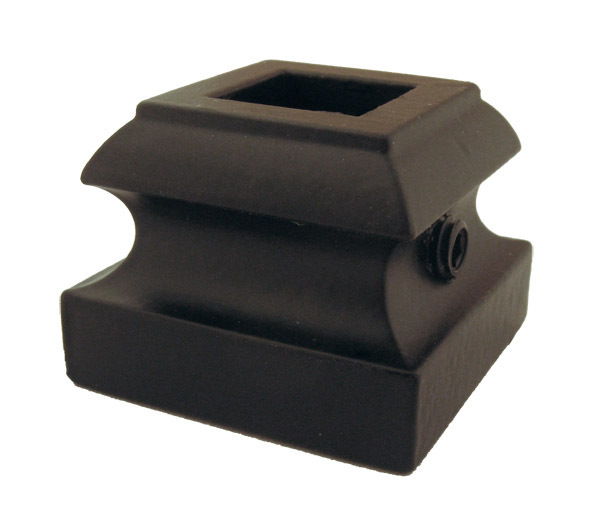 These baluster shoes are offered in Satin Black, Antique Bronze, Antique Nickel, Antique Verde, Copper Patina, Copper Vein, Flat Black, Grey Black, Nickel Verde, Oil Rubbed Bronze, Oil Rubbed Copper and Silver Vein to match our 1/2" Square Iron Balusters, and these shoes include the set-screws that are required during installation.